Swimmers and volleyball players were the big winners at the event. Hong Kong LGBT athletes brought home two medals from Paris earlier this month, the Hong Kong Free Post reported. A mixed-gender volleyball team claimed the gold medal in a win against Thailand, and swimmer Sebastian Turner—who belongs to an LGBT swimming club in Hong Kong—won the silver in the 800-meter freestyle swim. "We have straight people, we have gay people. So we play as a family. 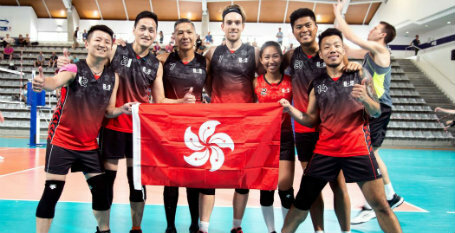 When you come to Hong Kong, you'll feel our welcome, definitely," said one member of the winning volleyball team. He attributed the win to patience, strong defense, and encouraging support from the sidelines. "The Gay Games are about more than just the sports. It's about the community," the volleyball player explained. Hong Kong, he added, will be a more convenient location for athletes from across Asia to join the Gay Games in 2022. It beat Guadalajara, Mexico and Washington D.C. in its bid and will be the first in Asia to host the games since they began in 1982. So it's not a perquisite to be gay to be in the team?